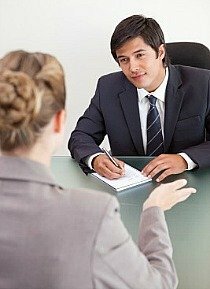 Interviewing Techniques - The key to successful interviewing is rapport building. Successful interviewers spend most of their time practicing the art of rapport building and communicating techniques. 1. Relax. The employment interview is just a meeting. And although you should not treat this meeting lightly, don't forget that the organization interviewing you is in need of your services as much as, or perhaps more than, you are of theirs. 2. The key to successful interviewing is rapport building. Most people spend their time preparing or interviews by memorizing canned responses to anticipated questions. Successful interviewers spend most of their time practicing the art of rapport building through the use of powerfully effective communicating techniques. 4. Dress appropriately. determine the dress code and meet it. If their dress is business casual, you still need to be dressed in business professional. Practice proper grooming and hygiene. 5. Shoes, of course, must be polished. 7. Call the day before and confirm the appointment-it will set you apart. 8. Be certain that you know exactly where you're going. Arrive in plenty of time. You should be at the receptionist's desk 10-12 minutes before the scheduled interview. 9. Prior to meeting the receptionist, check your appearance. Check your hair, clothing, and general image. Test your smile. 10. Secretaries, administrative assistants, and receptionists often have a say in the hiring process. Make a strong first impression with them. 11. Look around the office and search for artifacts that disclose the personality and culture of the company-and possibly the interviewer. This information will be helpful in initially breaking the ice, when you first begin discussions. 12. Be aware of your body language. Sit erect, with confidence. When standing and walking, move with confidence! 13. Your handshake should be firm, made with a wide-open hand, fingers stretched wide apart. Women should feel comfortable offering their hand and a firm and friendly handshake. A power handshake and great smile will get you off to a great start. 14. Eye contact is one of the most powerful forms of communicating. It demonstrates confidence, trust, and power. 15. During the interview, lean forward toward the interviewer. Show enthusiasm and sincere interest. 16. Take notes during the interview. You may want to refer to them later in the interview. If you are uncomfortable with this, ask permission first. 17. Be prepared for all questions, especially uncomfortable ones. Before the interview, script out a one-page response for each question that poses a problem for you, and practice repeating it until you're comfortable with it. 18. Communicate your skills, qualifications, and credentials to the hiring manager. Describe your market value and the benefits you offer. Demonstrate how you will contribute to the bottom line. Show how you can 1)improve sales, 2)reduce costs, 3)improve productivity, or 4)solve organizational problems. 19. Key in on specific accomplishments. Accomplishments determine hire ability. They separate the winners from the runners-up. 20. Listening skills are priceless! Job offers are made to those who listen well, find hidden meanings, and answer questions in a brief but effective manner. 21. Let the interviewer bring up salary first. The purpose of an interview is to determine whether there is a match. Once that is determined, salary should then be negotiated. 22. There is no substitute for planning and preparation, practice and rehearsing-absolutely none. 23. Practice Interviewing Techniques using video technology. A minimum of five hours of video practice, preferably more, guarantees a stellar performance. 24. Close the sale. If you find you want the position, ask for it. Ask directly,"Is there anything that would prevent you from offering me this position now?" or "Do you have any reservations or concerns? "(if you sense that). At the very least, this should flush out any objections and give you the opportunity to turn them into positives. 25. Always send a thank-you note within 24 hours of every employment meeting.